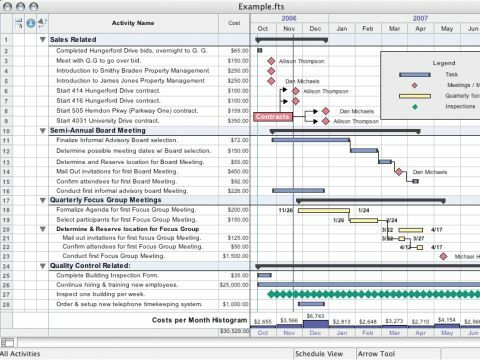 FastTrack Schedule is fundamentally about creating Gantt charts (bar charts that illustrate project schedules). However, it takes Gantt charts to the next level, making them useful productivity tools rather than simple bars. For a start, you can drop milestones on the time scale to represent point-in-time events, and add calendar views that isolate the tasks of single members of your project team. There's even a resource view, indicating the demands on a given person or piece of equipment. All this amounts to incredible attention to detail. FastTrack boasts support for Spotlight content searches, direct export to iCal, calendar publishing to .Mac accounts, and AppleScript. New to this version are features that will be very useful to a select group of users. Multiple project files can be consolidated into a master schedule, allowing complex projects to be carved up into smaller documents, but periodically brought together for a big-picture view. FastTrack also sports automatic archiving, which saves an archive copy of your project file at intervals. Distinct from a backup, archive copies accumulate instead of overwriting previous versions. FastTrack now reads and writes Microsoft Project files, giving Mac users a way to share Project documents without Windows. It also imports Mindjet MindManager documents, grouping parent and child branches into task groups. Schedules may also be exported to MindManager XML, resulting in a basic mind map. A few things temper our enthusiasm. The interface is quirky; the dialog for formatting bar styles, for example, uses a combination of tabs and pop-up menus that's disorientating. But if you can live with a few quirks, this app is the best in its class.